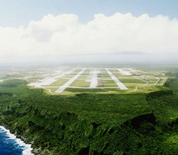 Andersen AFB is located in the US Territory of Guam and is one of two critical bases in the Asia-Pacific Ocean. It is under the command of Joint Region Marianas along with its neighbor, Naval Base Guam, approximately 30 miles away. The base host unit, the non-flying 36th Wing, provides support to deployed forces of the USAF and tenant units assigned to the base. Andersen AFB provides an ideal training environment because of its nearly unrestricted airspace and proximity to a naval bombing range 150 miles north. This Andersen AFB directory features the critical info you’ll need to navigate through the many facilities and recreational opportunities available on base.